The new iPad 9.7 is a great tablet for those that want just that: a tablet. It's shorn of the power and performance of the iPad Pro range, but the addition of Apple Pencil compatibility and the A10 chipset bring it pretty close, and for a lot less cash. It irks that you need to buy the Pencil separately to unlock a key feature, and design-wise we're seeing something pretty old-school here… but for the price it's hard to criticize too much, and this is still one of the best tablets on the market. The new iPad 9.7 for 2018 is designed to achieve one thing: deliver the best of Apple’s tablet efforts at a more affordable price. Note that we say more affordable, rather than cheap – because the cost is still higher than many other tablets out there – but the new upgrades bring a lot to the iPad, bridging the gap between a ‘standard’ slate and the more impressive iPad Pro range. Support for the Apple Pencil adds another dimension to the tablet, enabling a new method of interaction and bringing with it a slew of new apps to interact with, and the upgraded chipset inside – the same one that powered the iPhone 7 – offers more power than many will know what to do with. The upshot? You’ve now got a hugely capable tablet, one with more power and offering more possibilities, at a fairly reasonable price point. You may be thinking that this is a ‘student’s iPad’, as Apple has made a big deal about the new tablet's classroom credentials, but in reality most of the people who buy it will be those who want something to use on the commute and around the house – and as you’ll see, it fares pretty well in those respects. While this might all sound impressive, it’s still not the full picture, as all these features are combined with the best tablet platform out there, iOS – there’s a reason the iPad has sat so high in our best tablet rankings for so long. The new iPad was launched in March 2018, and comes with a range of storage and connectivity options. The new iPad 2018 price started at $329 (£319, AU$469), but schools will get a discount in the UK and US of around 10%. At $329 (AU$469) the new iPad price is exactly the same as the starting price of the new iPad (2017) – and both come with 32GB of storage – in the US and Australia, while in the UK it looks like consumers are being treated to a discount, as currency fluctuations meant the basic 32GB version is actually £20 cheaper than 2017's iPad. That's for the Wi-Fi only model, with the 32GB slate with cellular connectivity setting you back $459 (£449, AU$669). The 128GB version begins at $429 / £409 / AU$599 for those who want more storage, with an extra premium to pay if you want some bytes of data floating in on the go. The Apple Pencil… it’s tough to work out whether it’s a genuinely innovative tool or not. We’ve been using it for a few years now, and have found that it’s great for some things, but useless for others. Also, let’s not forget that it costs £99 / $99 / AU$145, which means you need to pay around 33% of the price of the new iPad, on top of the cost of the slate itself, in order to access the key new feature. It’s cheaper for those in education, and there is the Logitech Crayon available in the US for half the price (and less functionality), but it’s worth bearing in mind when buying the new iPad. If you’re looking for something to replace a notepad, we wouldn’t recommend the new iPad – or any iPad for that matter, as it’s really difficult to write legibly on them, thanks to the way the tip of the Pencil glides across the surface. Apple could make the glass more matte and ridged to help, but that would make the display harder to see, so it’s not an easily solved conundrum. The Notepad app is fine, and allows you to write and sketch, and now the iWork Suite from Apple is collaborative, and you can mark-up documents on it (it took Apple far too long to enable this feature, with Microsoft inexplicably adding in mark-up functionality first to its iPad apps. This would be a lovely feature if, as referenced, writing on it was easy; but notes can't simply be jotted, they require concentrated efforts of penmanship… and most of the people we work with are on Google Docs, so sharing a marked-up Pages document was useless. In a classroom environment it will be more useful if a teacher and the students are all on the same platform… as long as the teacher has immaculate handwriting and patience to write a little slower. If you’re just underlining sections or pointing to things then the finger is just as good – so maybe make sure you really need the Pencil before forking out all that cash. However, where the stylus does become worth the outlay is when you want to be artistic – there are a few good apps out there for the Apple Pencil that let you color, change the shading of a photo or get pretty deep into some photo / video manipulation. We had a great time coloring and sketching during our review, and even if you’re bereft of any kind of talent there’s a lot you can do. The multi-level pressure of the Pencil comes into its own here, and if you’re in any way artistic then you’ve got loads – and loads, and loads – of different styles of brush, pen and other drawing implements you can work with. We were all expecting Apple to stick with the same ‘good enough’ A9 chipset from 2017’s iPad and drop the price, but it’s gone up and shoved in the A10 Fusion chip that powered the iPhone 7 and 7 Plus, and which is close to the A10X chip in the new iPad Pro range. That's combined with 2GB of RAM, so there's more than enough power here for nearly any task that most users will want to do with the new iPad, and certainly for emailing, web browsing or watching video. We noticed some slowdown with heavier apps, for example when processing and opening multiple photos, but we never had to wait too long, and rendering times were still pretty impressive. That said, if you’re going to do a lot of more demanding work, that’s why Apple has the iPad Pro 10.5, with the extra power in the CPU and double the RAM. In our tests, the new iPad (2018) returned a similar single-core benchmarking score to the more powerful iPad Pro 10.5, showing that if you’re not going to be using the cheaper iPad intensively then there’s no reason to spend the extra cash. It might seem hard to fathom why Apple has thrown in the extra power here, but users will hang onto their iPads for a long, long time (much longer than they would an iPhone), and having more power means they’ll keep running smoothly, and remain upgradeable, for longer. 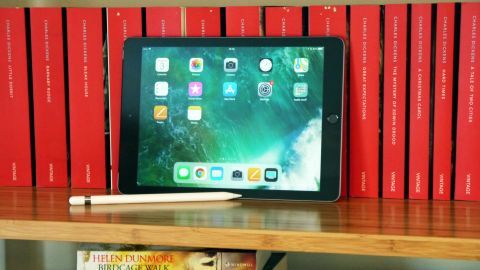 You’ll be unlikely to use most of the power in the new iPad, to be honest, but the upshot it that it runs incredibly smoothly, and apps open and close with ease… and it’s likely to keep doing that for longer, so you won’t need to upgrade as soon.